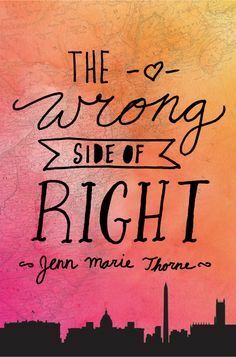 THE WRONG SIDE OF RIGHT is Jenn Marie Thorne's debut novel, and we're happy she stopped by to share more about it. Jenn, what scene in THE WRONG SIDE OF RIGHT was really hard for you to write and why, and is that the one of which you are most proud? Or is there another scene you particularly love? Without giving away any spoilers, there's a scene late in the book when Kate is sitting in her room with her stepmother, Meg, basically hashing out all of the things that have gone wrong over the course of the story. She's really raw and vulnerable in that scene--the trick was to find the right balance of Kate being strong and needing answers and also being young and lost and apologetic. There were a lot of scenes that hurt my heart to write, but that one just had so much tension without any easy answers or resolutions. How long did you work on THE WRONG SIDE OF RIGHT? I wrote the first draft of TWSoR during NaNo, after spending that October prepping, researching and outlining extensively. Then I did a quick December revision and sent it to some beta readers. I did two more revisions before sending it to agents. Then another revision before it went out to editors. And then, of course, an unbelievable number of revision rounds with my editor. This is something I don't think many pre-pubbed authors realize--once you get a book deal, your work is just beginning. I learned a ton from working with my editor. You get a really clear picture of your writer tics and habits that you didn't even know you had. One big adjustment I've made to my writing is that I used to put in quick exposition sections, in order to, I thought, pick up the pace in the story. My incredible editor quite rightly pointed out that they were "tune out" moments for the reader, doing the opposite of what I'd intended for them to do. Now, when I catch myself cheating by writing those sort of bridge sequences, I hit delete and replace them with action-dialogue scenes that get the information across and drive the story in a more visceral way. At some point, working on the novel I wrote before THE WRONG SIDE OF RIGHT, I realized that I personally needed to write every single day, so that it became a constant habit. Some days I only wrote one sentence--but it was enough to keep my mind whirring, so that everything reminded me of my book. I would think about my book while I was driving, in the shower, walking the dog. I was constantly working, even if I wasn't sitting at that keyboard. But if I skipped a day, my brain turned itself off. So now, when I'm drafting or doing a big revision, I make sure to at least open the document and type one thing before I'm allowed to go to bed each night. Jenn Marie Thorne writes YA fiction from her home in beautiful Gulfport, Florida, alongside her dashing husband, her two daring toddlers, and her trusty hound Molly. An NYU-Tisch grad with a BFA in Drama, Jenn still enjoys making a fool of herself on at least a weekly basis. Other hobbies include writing about herself in the third-person, studying classical voice, learning languages, and traveling the world with her family. Her debut novel, THE WRONG SIDE OF RIGHT, is coming March 17, 2015 from Dial Books for Young Readers (Penguin). Congratulations on your novel! I love what you said about always working; it is so true that writing even one sentence a day helps keep us on track and prevents our brains from shutting off.